I remember thinking while watching Band of Brothers in 2001 with Wendell how wonderful it would be if the same group of people did a miniseries about the Pacific Theater of World War II. Sunday night HBO aired part one of the miniseries I was waiting for. Overall, like Band of Brothers, it looked great, had a strong script, amazing costuming, raw battles scenes and actors that were cast perfectly. The only thing I didn't like was that during climatic battle at Alligator Creek on Guadalcanal I wasn't given a good sense of where the action was taking place and why. Why were the Marines at Alligator Creek and why did the Japanese attack the way they did? All of those questions can be answered here but a little more context in the episode would have helped. That was the strength of Saving Private Ryan and Band of Brothers, they both laid out nicely what exactly was being fought over and why. A fine example of that is the Brecourt Manor Assault in episode two of Band of Brothers. They even went so far as to draw you a map of their objective. When the fight started you knew what was going on. It was still chaotic but it was more than just a shaky camera and machine gun fire. 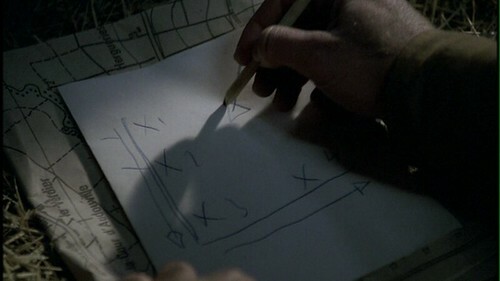 Melanie thinks that in the first episode of Pacific they were showing us how confusing Guadalcanal was to the average Marine. That may be so. I'm just curious as to how the portray the Battle of Edson's Ridge. What did blow me away was the opening credits. The sketches coming to life took me completely by surprise. Another nice subtle touch is the crumbling point of the pencil is the same color as the sands of Iwo Jima. the show is off to a great start! I started to watch it last night. I got as far as the battle scene and got interrupted. It looks OK, hope the pace picks up a bit. Ha! I was about 4 minutes from the end. I went back to the show for the closing Happy Birthday song.